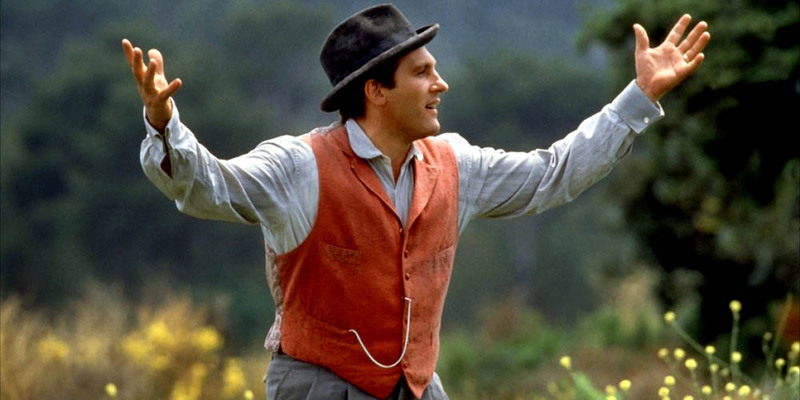 Claude Berri’s Jean de Florette and Manon des Sources, a two-part adaptation of Marcel Pagnol’s “L’Eau des Collines,” constitutes one of the finest examinations of the human condition to exist on film. Spanning a fiercely slow-burning four hours, and four generations of the Soubeyran and Cadoret families in 1920s Provence, its essence lies in the life-giving provision of water to a rural community. From this elemental starting point, the two films – which exist in conjunction and must be seen one after the other – use its importance to those who live off the land to reflect upon what it means to love thy neighbour. Great pains will be taken to avoid spoilers but in order that a discussion of Berri’s masterpiece do it justice certain plot elements must be divulged. 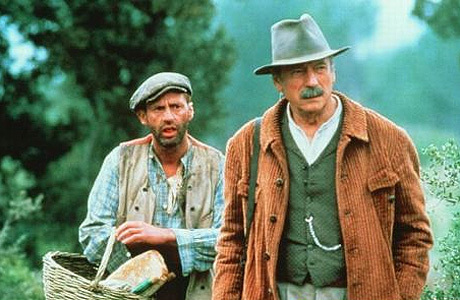 Florette, the first film, begins with the introduction of Ugolin (Daniel Auteuil) and César (Yves Montand), nephew and uncle respectively. Patriarch and wealthy landowner, César, wants to ensure that his one heir, and the last of the Soubeyran line, find his feet and continue the family lineage. Daniel Auteuil and Yves Montand. The rather gormless Ugolin chooses to grow carnations rather than fruit or crops, and, learning of their potential value, César is swiftly on board; however, a plentiful supply of water will be needed during the arid summer months for the venture to be a success. Thanks to the fortuitous death of a neighbour, whose land is fertile and where a rich source is located, the Soubeyrans see an opening and block the source, rendering the land almost worthless. They are thwarted by Jean Cadoret (a hunchbacked Gerard Dépardieu), who inherits from his mother Florette, a long lost flame of César’s. Jean, previously a taxman in a nearby town, wishes to live off the land and raise rabbits to be sold at market and sets up home with his wife (Elisabeth Dépardieu) and young daughter, Manon (Ernestine Mazurowna). His hopeless optimism and blind naivete in the face of the Soubeyrans’ scheming plays out under the simmering heat of summer in the south of France. A viewer of Jean de Florette finds themselves helpless. Knowing that the Cadorets’ salvation lies just a stone’s throw from the house, we watch all three labour to maintain crops that cannot survive and can do nothing to prevent the inevitable. Waking to the thunderous and life-giving sound of a storm breaking, the trio rush outside to feel the first drops, only for the clouds to pass by in the distance. Other townsfolk, also well aware of the existence of a nearby source, who see Jean, his wife and daughter schlep miles to replenish their supplies, could speak out but do nothing. It is their inaction, and indeed intimidation and shunning of the young family, that gives rise to the film’s questioning of collective responsibility and how thy neighbour should be treated whether it is your business or not. Jean, delighting in the beauty of La Mère Nature. Verdi’s “La forza del destino” dominates the film’s score and could well be used as a fatalistic subtitle for the whole piece. Its mournful tone is alternately played by Jean on his harmonica, the simple and sentimental, and then by orchestral strings, the monumental, adding a grandeur and gravitas which elevate the tragic proceedings to something more than a connivance between landowners. Even Bruno Nuytten’s breathtaking cinematography is a two-edged sword, initially capturing the Provencal countryside in all its welcoming splendour before it, too, is shown to be dusty, barren and unforgiving. As Jean, Dépardieu’s desperately wide-eyed, giddy enthusiasm and determination to succeed make the first portion of Berri’s tale pitifully uplifting. Yves Montand, in one of the last performances of a towering career, is avaricious, duplicitous and conniving but yet (and you may disagree with me) we cannot completely condemn the man. Auteuil portrays a simpleton whose wayward moral compass is thrown off by a desire to live up to familial expectations while also befriending the man he must destroy to achieve the floral success of his dreams. A decade elapses between the première and deuxième parts of the film but the transition from one to the next is seamless – for francophones or those unafraid of subtitles, the films can be watched back to back. It’s well worth it. The first image of Manon des Sources shows a carpenter putting the finishing touches to a coffin. This is followed by multiple shots of a plentiful supply of water; time has passed but life, and death, go on. The Soubeyran carnation crop is abundant and Ugolin counts coins with glee. He spies on Manon, now a beautiful young woman (played by Emmanuelle Béart) living as a goatherdess in the hills, while she bathes in a pool and is instantly infatuated. She falls for another and wishes nothing but revenge upon Ugolin and his uncle, whose actions caused the ruin of her father. The irony of the unrequited love here being that Auteuil and Béart would go on to have a decade long relationship and a child together – if only Ugolin had been so lucky. Focusing on the wronged Manon and the repercussions of the injustice she suffered as a child, the second film has none of the joix de vivre of Florette, striking a decidedly bitter tone. Béart is almost uncontrollably wild and her eyes seethe with anger and resentment. A product of her environment, she is a force of nature and this performance would launch the young actress to stardom. The vengeful tone of Manon means that it does not have the emotional weight and balance of the first film. When Manon chances upon the main source of the town’s water supply and duly blocks it (oh, the irony) the unending gossiping, games of pétanque and glasses of pastis cease with immediate effect. The hypocrisy of those who ignored the Cadorets’ plight ten years earlier is tangible, much to the delight of the young woman and indignation of the local priest whose congregation grows markedly during the crisis. Those who merit it receive their comeuppance and upon the film’s conclusion a visitor, long absent from the small town, delivers a sucker punch of such enormity that all we have witnessed is now brushed in a different light. Berri’s duology is an allegorical tale of humanity and woe that would stand up to the stature of any Greek tragedy with characters as rich as the earth on which their existence depends. Like any great film, it is a story that will stay with you long after a first viewing and should make you see the world a little differently. It is four hours very well spent. Posted in Classics, French Film. Bookmark the permalink. Well written, Matt. I have seen both these films several times in the original French versions. They are so poignant and heartbreaking. I don’t think I could watch them again. Thank you, Brigitte! Poignant and heartbreaking they are indeed.